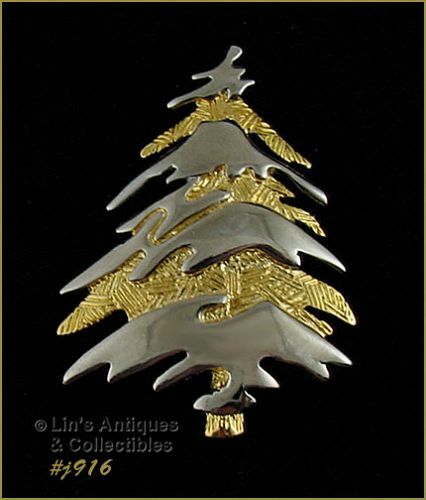 This Eisenberg Ice Christmas tree shaped pin has a more modern look! It’s made of textured gold-tone and silver-tone metal – no rhinestones at all. Pin measures 2” long (at longest), 1 ½” wide (at widest), and is marked Eisenberg Ice. Eisenberg Ice ornament pins are so pretty and the green enamel ones are somewhat difficult to find! 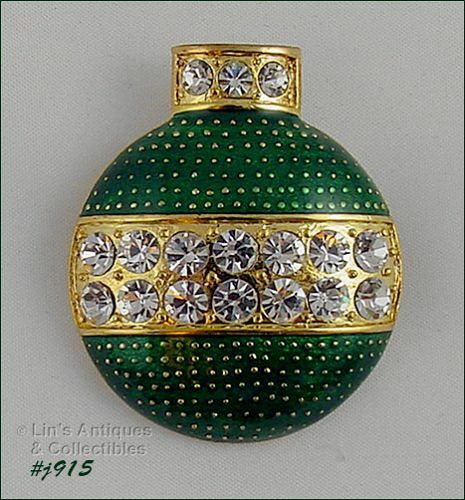 Pin is gold-tone with green enamel and sparkly clear rhinestones. I measures 1 ¾” long (at longest), 1 5/8” wide (at widest), and is marked Eisenberg Ice. 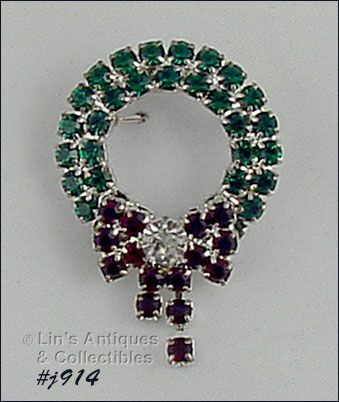 Beautiful rhinestone color on this Eisenberg wreath shaped Christmas pin! 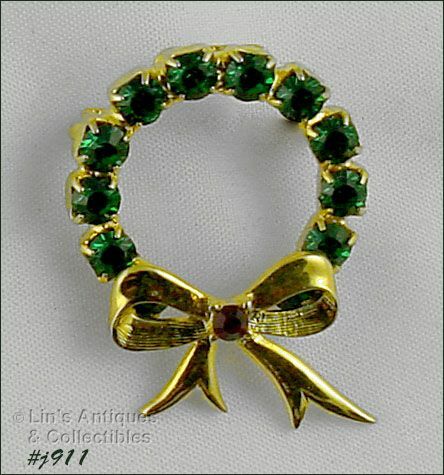 The green is a dark emerald green color, the bow is dark red, and there is a larger clear rhinestone in the center of the bow. Pin measures 1” diameter. 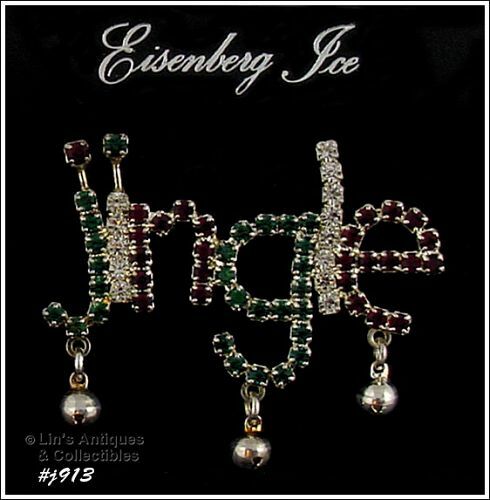 All rhinestones are prong-set and pin is marked Eisenberg Ice. The rhinestones are dark green, dark red, and clear and all are prong-set. There are 2 rhinestones attached as “dots” over the letter j and the letter i and there are 3 tiny jingle bells attached to the bottom of the pin. I have 3 available in this listing. 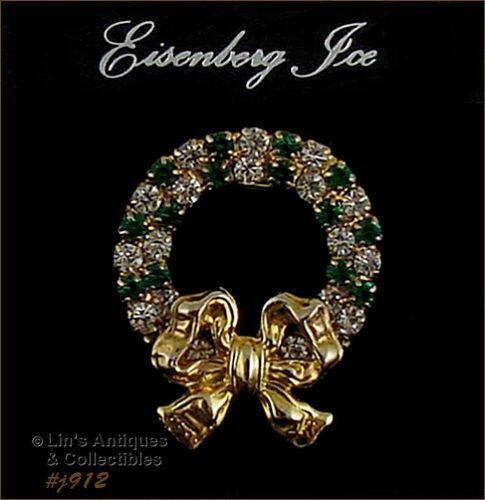 Another pretty Eisenberg wreath shaped pin! 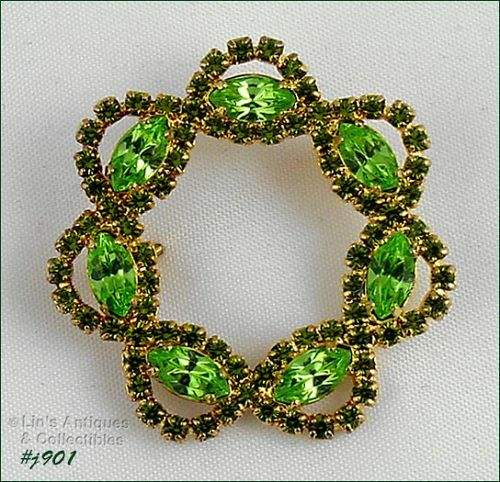 This one is gold-tone with a gold-tone bow and green and clear prong-set rhinestones. The shape of the bow is especially pretty on this pin. It measures 1 1/8” x 1 3/8”. Pin is not marked but is still on the original Eisenberg Ice store display/hang card. This is a very pretty little Eisenberg Ice pin – perfect for a lapel or collar! Pin measures 1 ¼” long (at longest), 1” wide (at widest), and is marked Eisenberg Ice. The pin is gold-tone, wreath is dark green rhinestones, and the gold-tone bow has a dark red rhinestone in the center. All rhinestones are prong set. 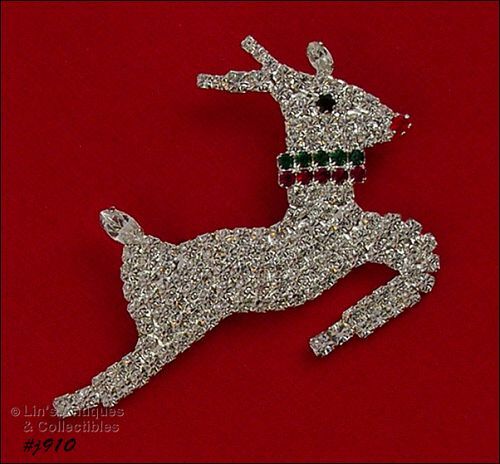 Beautiful pin – Rudolph in “flight”! Pin is silver-tone and is completely covered with prong-set rhinestones. It is super sparkly – so much so that we had to adjust our lighting to obtain a decent photo which diminishes the sparkle/light reflection of the rhinestones. Pin measures 2 ¾” long (at longest), 1 ¾” wide (at widest), and is marked Eisenberg Ice. 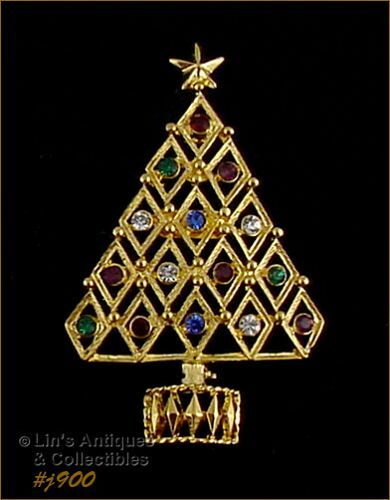 Another very pretty Eisenberg Ice Christmas tree shaped pin! This one is gold-tone with red enameling and is “decorated” with a clear rhinestone garland. Pin measures 2 ¼” long (at longest), 1 ¾” wide (at widest), and is marked Eisenberg Ice. 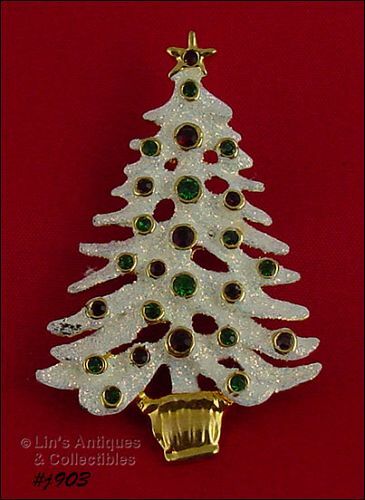 This Eisenberg Ice Christmas tree shaped pin is small but has oodles of sparkle! It’s silver-tone, “decorated” with aurora borealis rhinestones, measures 1 ¾” long (at longest), 1 ¼” wide (at widest), and is marked Eisenberg Ice. 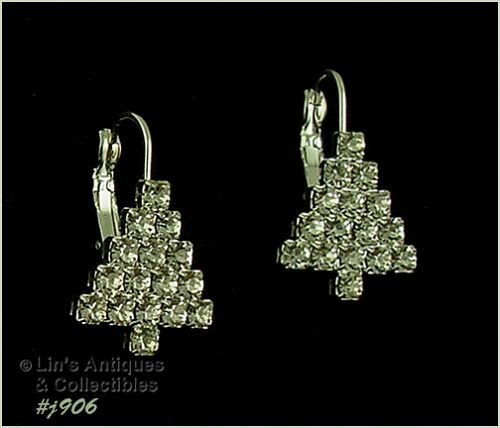 These Eisenberg Ice Christmas tree shaped earrings are beautiful with lots of sparkle! They are so sparkly and light reflective that we had to adjust our photo tent lighting to obtain a decent photo – in doing so, the sparkle is diminished in photo so please know that rhinestones are not dull, they are in fact super sparkly and light reflective! Earrings are pierced lever-back style, measure 5/8” x 5/8”, and are marked Eisenberg Ice. All rhinestones are prong-set. 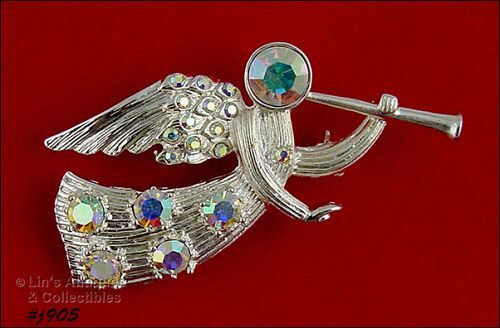 EISENBERG ICE RHINESTONES TRUMPETING ANGEL SILVER TONE PIN 2 AVAIL. Beautiful Eisenberg Ice trumpeting angel pins! They’re silver-tone with aurora borealis rhinestones, measure 2 ¼” x 1”, and are marked Eisenberg Ice. EISENBERG ICE RHINESTONE ANGEL WITH TRUMPET GOLD TONE PIN 3 AVAIL. 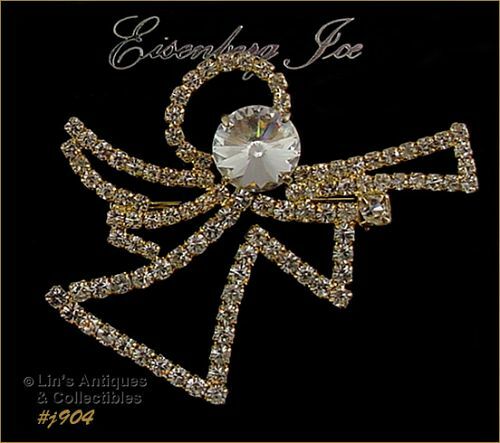 These Eisenberg Ice angel pins are so very pretty with lots of sparkle! Angel shaped gold-tone pins are completely covered with clear rhinestones. They measure 2” x 1 ¾”, are marked Eisenberg Ice, and are still on the original Eisenberg Ice store display/hang cards. I love Eisenberg Ice glitter trees! This one is “decorated” with red and green rhinestones. Pin measures 2 ¼” long (at longest), 1 ½” wide (at widest) and is marked Eisenberg Ice. It is in excellent condition but it has a tiny “rub” on the end of a limb (see photo) that I would surmise occurred during storage. Priced to reflect small imperfection. This is a very pretty Eisenberg Ice snowflake pin! 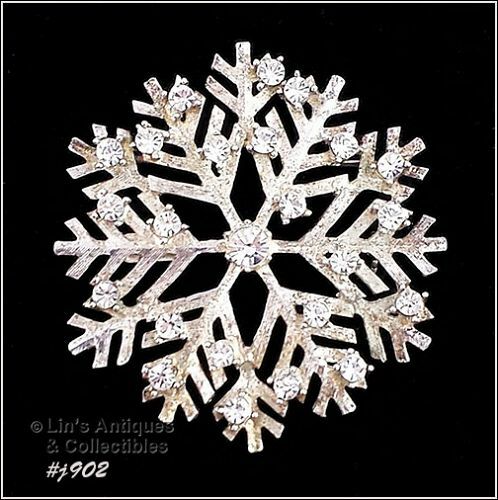 It’s silver-tone, shaped like a snowflake accented with clear rhinestones, measures 2 ½” diameter, and is marked Eisenberg Ice. 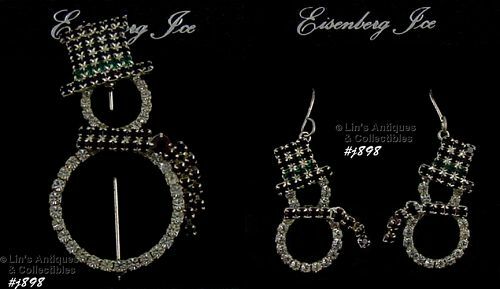 These Eisenberg Ice circle pins are so pretty – they’re gold-tone with green apple color rhinestones! Pins measure 1 ½” diameter and are marked Eisenberg Ice. 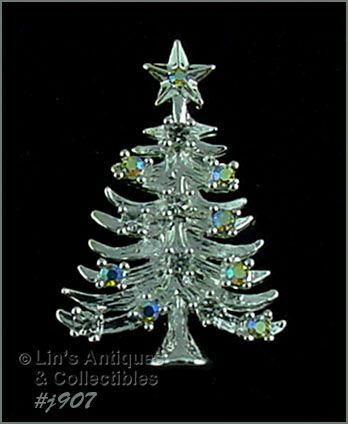 EISENBERG ICE CHRISTMAS TREE PIN WITH MULTI COLOR RHINESTONES 4 Avail. 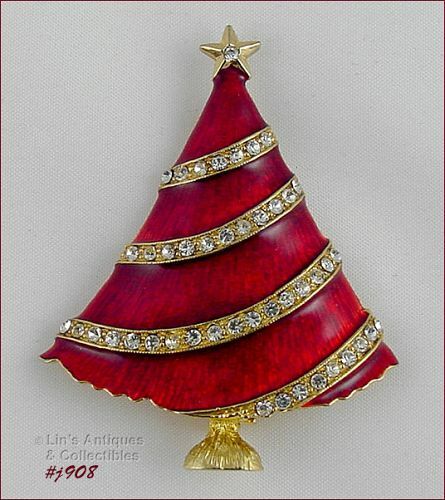 Really cute little Eisenberg Ice Christmas tree pin in this listing! It’s gold-tone and is accented /decorated with multi-color rhinestones. Pin measures 2” long (at longest), 1 ¼” wide (at widest), and is marked Eisenberg Ice. This listing has an Eisenberg Ice bow shaped pin! 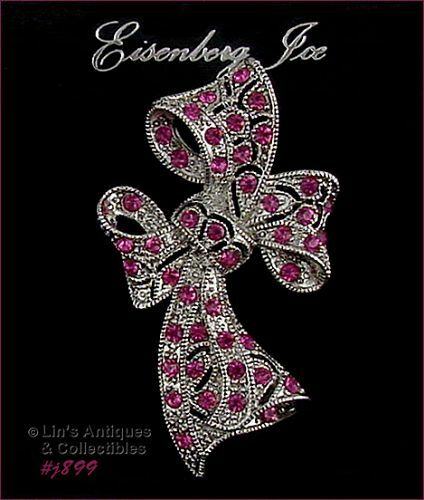 It’s silver-tone, accented with pink rhinestones, and back is marked Eisenberg Ice. Pin measures 2” long (at longest), 1 ¼” wide (at widest) and is still on the original Eisenberg Ice store display/hang card. Adorable Eisenberg Ice snowman pin and matching pierced earrings in this listing! Pin measures 2 ¼” long (at longest) and 1 3/16” wide (at widest). Earrings measure 1 3/16” (at longest) and 5/8” wide (at widest). Due to their shape, they are unmarked but are still on the original Eisenberg Ice store display/hang cards. I have 2 sets available.